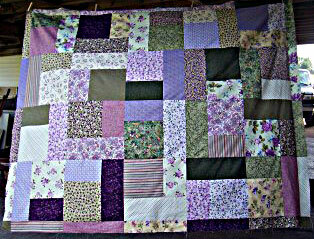 I can't tell you how much your notes encouraged me with the Turning Twenty quilts. Thank you so much! I finished up the second top the other day and finally got a few minutes to take a couple of pictures. 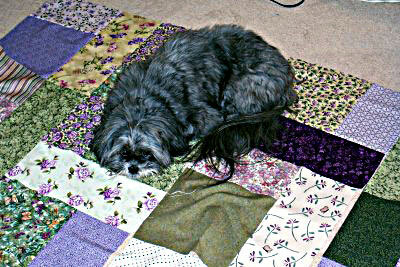 I'm sending one also of my furbaby, Meiko, who considers all quilts hers until it's proven otherwise, as she is "helping" me by planting herself on the blocks before they're sewn together. I'd have gotten one of her rolling around on them but I didn't have the camera ready! Again, I can't thank you enough for your warm note; it really meant alot to me. I've been told that I tend to be too "matchy" when I've done some piecing in the past and I almost gave it all up. Anyway, here are a couple of pictures for you. I hope you and yours are well. Just out of curiosity, do you attend the quilt shows like the one coming up later this month in Nashville?